The enterprise was established in 1962 and operates in the municipality of Turbo, in the sub-region of Urabá Antioquia, approximately 340 km north of Medellín, Colombia’s second-largest city. In 1963, the multi-estate plantation, along with other groups of banana producers, was a co-founder of UNIBAN S.A. Today, this is one of the most important international trading companies in Colombia, dealing mainly in bananas and plantains. Bananeras de Urabá has experienced many highs and lows due to the numerous domestic conflicts, unstable regimes, and armed groups operating in the region (FARC and EPL). This unstable and unsafe environment has seriously threatened the functioning of the enterprise, and the lives of its workers. In 1988, in one of the worst massacres that took place in the region, 17 workers were executed by firing squad in the Madrigal farm (at the time called Honduras farm). Colombia produces around 2 million tonnes of bananas a year, mainly of the Cavendish Valery variety, on an area of approximately 80,000 hectares. The majority of Colombia’s bananas are produced for export in the Urabá sub-region of Antioquia department and in the north-eastern part of Magdalena department. Only about 8% of the production, mainly coming from Valle del Cauca and Tolima departments, is sold locally. Bananas play a significant role in the country’s economy. In particular, they are the country’s third agricultural export after coffee and cut flowers. In 2011, the country exported more than 1,800,000 tonnes of bananas, for a total of over USD 775,000,000, making it the world’s fourth-largest exporters of bananas after Ecuador, the Philippines, and Costa Rica. The main destination of Colombia’s banana exports is the European Union (62% of total banana exports), followed by the United States (24%). Bananeras de Urabá operates on an area of 660 hectares and employs 456 workers with permanent employment contracts (4% are women). All the workers live outside the farms, at an average distance of 17 km. 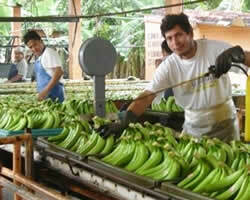 In 2012, the enterprise produced around 26,600 tonnes of bananas for a total sales value of more than USD 10,700,000. The production is entirely exported, mainly to Europe, through the export company UNIBAN S.A.
Bananeras de Urabá was Fairtrade Certified in 2005. In 2012, the enterprise sold 1,237,149 18.14kg-boxes of Fairtrade certified bananas, corresponding to 84.37% of the annual production. For its Fairtrade sales, Bananeras de Urabá receives the Fairtrade Minimum Price of USD 9.80/box (18.14kg), or the market price if higher. The Fairtrade Minimum Price is particularly beneficial during the second trimester of the year, when, in the conventional market, the price per box of bananas always drops significantly. Bananeras de Urabá is also paid a Fairtrade Premium Price of USD 1/box of bananas for the workers to invest in social projects of their choice. The premium is managed by a Premium Committee, which includes elected representatives of the workers and management, with the latter serving as advisors. The Premium Committee decides on possible uses of these funds, and distributes them to the different farms in proportion to the boxes of Fairtrade certified bananas exported by each of them. Establishment of a revolving loan fund that workers can draw on to finance homeownership, home construction, renovation and improvements, domestic emergencies, as well as purchase of home appliances. In 2012, thanks to improved access to loans, workers invested, on average, USD 2,690 in their homes (mainly in improvements in their kitchens and toilets, and purchase of goods for the house). Construction, funded entirely by the premium, of a new condominium building for dozens of Bananeras de Urabá workers and their families. These workers were offered the possibility to purchase an affordable condo with a low-interest loan from the premium fund and enjoy safer and more pleasant housing conditions. Introduction of loans for education expenses and education scholarships to improve access to education and training for workers and their families. In 2012, 58.8% of households received at least one educational scholarship. In this context, an important development is the establishment, in response to the increased demand for education, of new local academic institutions. Small microloans, along with skills-building programmes, offered to the employees of the enterprise to help them start small businesses and create additional sources of income to support their families. In this regard, some workers and workers’ wives have begun training in leather working in order to manufacture and sell shoes and sandals. Moreover, in collaboration with SENA (National Learning Service), Bananeras de Urabá is training women on how to bake bread and cakes, as well as selling fried ‘empanadas’, as a means to generate additional income. Implementation of the ‘Somos Familia’ Programme (We are family), which aims at improving the quality of life of the poorest families affiliated to the enterprise. This programme mainly focuses on women and includes support, for at least one year, via talks, training, and recreational activities, among others. Collaboration with the Mayor’s office on a series of community programmes, including part-funding of the construction of a bridge and a library in the Barrio Obrero neighbourhood (the enterprise donated more than USD 50,000 for the plans and designs). Donations have also been made to local hospitals and schools (whiteboards, chairs, computers, books, and the construction of sanitation units). Provision of financial support (money for the purchase of kitchen utensils and appliances) for a food assistance programme for the elderly in the community of Nueva Colonia. Support of recreational and sporting services, including parks, playing fields, sport tournaments, and other integration activities. Bananeras de Urabá has also donated musical instruments to the ‘Sounds of Peace’, a youth community programme which promotes community, peace and harmony through music.